That the vast majority of these atrocities were and are being committed by conventional warfare methods rather than chemical weapons matters little to those being subjected to such barbarism. Albert Einstein once famously defined insanity as “doing the same thing over and over again and expecting different results.” This perhaps best describes the ongoing policy of the international community toward Syria and other rogue regimes in the Middle East.Ever since the military coup d’état during 1970 which brought Hafez Assad to power in Damascus, the Syrian regime has ably used repression, terror and violence to consolidate and maintain its power. From the outset, Assad dealt harshly with the nascent Sunni uprising against his Alawite minority rule. In 1976, Syria, using the backdrop of the Lebanese Civil War as an excuse, invaded its troubled neighbor and violently suppressed any and all opposition. This particular oppression did not end until 2005, when the Syrian regime was implicated in the murder of Lebanese ex-premier Rafik Hariri.At home and abroad, the Syrian regime had few compunctions about being involved in terror. In a brutal 1982 attack on its own people, Syrian regime forces surrounded the town of Hama for 27 days, slaughtering tens of thousands of its inhabitants, with little outcry from the outside world.Since 1979, Syria has been on the US State Department’s list of designated state sponsors of terror “because of its continuing support and safe haven for terrorist organizations.”Syria’s facilitation of global terror extends beyond merely providing support and succor to organizations like Abu Nidal, Hezbollah, Islamic Jihad and Hamas. Syria has been actively and intimately involved in murderous terrorist attacks around the world. These attacks have targeted Europeans, Americans and Israelis. Yet, there was no world outcry, nor has the direct responsibility and implication of the Syrian Arab Republic in hijackings, bombing and grenade attacks, murders and massacres led to any meaningful action by the international community to stop Syria’s heinous conduct.The long and bloody history of the Syrian regime, beginning with the father Hafez Assad, has been subsequently continued by his son and successor Bashar Assad.The recent bloody repression of the civil uprising in Syria, with more than 100,000 people confirmed dead by UN reports, and the latest alleged use of chemical weapons against its own people, surprisingly appears to have caught many decision-makers and opinion- shapers unprepared to address the reality of the situation. In what the United Nations is describing as the “humanitarian calamity” of the century, reportedly two million Syrians including children have become refugees and over five million internally displaced. This at the same time Syria has been seeking a seat on the United Nations Human Rights Council.It is clear that Syrian state-sponsored terrorism against the outside world and against its own people stretches back decades and continues to the present day. The long-standing policy and practice of the Syrian regime of using terrorist acts as its modus operandi is a direct result of the blind eye of the international community that has allowed the Syrian Arab Republic to act with impunity. The world didn’t care then and it doesn’t seem to care now.This unmistakable correlation is sadly reminiscent of the Evian Conference in 1938 organized by the Western allies in response to the Nazi repression of the Jewish communities in Europe. The conference, a classic example of a failure to act, merely represented lip service to Jewish suffering. Hitler, studying the Evian proceedings very closely, correctly concluded that the inaction gave him the green light for genocide and impunity from international intervention in the Holocaust. Likewise, today, we hear strong words declared in parliaments around the world for the suffering of the Syrian people. However, the Syrian people do not need words, they need action. Most recently, the flurry of activity has been in response to the reported use by Syria of chemical weapons. Talking, however, may or may not produce a solid understanding for Syria to not only secure the chemical weapons it possesses but to actually turn them over for international safeguarding or destruction. In that regard, the focus has shifted from the atrocities committed by the Syrian regime to the possibility of Russian-led negotiations averting a military strike by the United States. Yet, even in the unlikely event that Syria actually relinquishes its stockpile of chemical weapons, the glaring reality exists that the regime’s crimes against humanity extend far beyond the use of these weapons. Both Assad and his father throughout the decades have slaughtered hundreds of thousands of innocent people, sponsored dozens of terrorist attacks and relegated millions more to the squalid living conditions of refugee camps. Failing to provide protection for the Syrian people is a travesty of justice and makes a mockery of international law. In the name of dignity, human rights and humanitarian obligations, the world must immediately intervene to prevent the Assad regime from expanding its killing machine. The recent chemical gas massacre in Ghouta is merely a test case of the world’s resolve. Thus far the reactions have sent a clear message to Assad and his cohorts that their impunity remains not only intact but at apparently acceptable levels. This allows Assad to publicly appear, deny his involvement and threaten reprisals notwithstanding the reported evidence of intolerable acts committed upon the Syrian people. Why has most of the world been tolerant of the Assad regime? Why isn’t the Assad regime being held accountable as Libya and Gaddafi have been held accountable? Why does it appear that only France, led by President Francois Hollande, is really willing to not only threaten but to act and require Syrian accountability? Beyond Syria, another bloody regime is also taking note of the feeble international reaction. The Islamic Republic of Iran, also a designated state sponsor of terror, possesses an advanced nuclear weapons program reportedly approaching dangerous capabilities. The threats that “all options remain on the table” from Western leaders regarding Iran’s illegal and illicit nuclear weapons program will remain hollow as a result of the seemingly feeble response to the ongoing massacres in Syria. Make no mistake – the radical and hegemonic ayatollahs in Tehran are paying close watch. The world cannot continue acting the same way and expect different results. Mere words and empty declarations did not help the passengers of EgyptAir Flight 648 who were shot in the head by Syrian-sponsored Abu Nidal terrorists, nor the tourists shot at the TWA and El Al counters in the Rome and Vienna airports in 1985, nor the residents of Hama or Lebanon, and will not help the people of Syria or the region today. The international community needs to send a clear and unequivocal signal through decisive action that the impunity to massacre, to terrorize, to threaten and to displace has ended. The people of Syria deserve and are entitled to protection. The Assad regime must be held accountable, including being prosecuted at the International Criminal Court in the Hague for their war crimes and crimes against humanity. Indeed, the world must act in order to prevent more Syrian-sponsored terrorism and destruction. 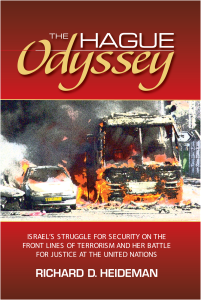 The writer is an international attorney and lead counsel on behalf of American victims of Syrian terrorism, who has received on behalf of his clients the highest judgments awarded by US Federal Courts against the Syrian Arab Republic as a state sponsor of terror, and is the author of the recently published The Hague Odyssey: Israel’s Struggle for Security on the Front Lines of Terrorism and Her Battle for Justice at the United Nations (Bartleby Press, 2013).